Editor-in-Chief Dr. Jing Lei, State University of New York at Oswego, USA. Journal of Anthropology and Archaeology is a peer-reviewed international journal, which publishes original papers promoting theoretical, methodological and empirical developments in the discipline of socio-cultural anthropology. The journal provides a forum where a wide variety of different anthropologies can gather together and enter into critical exchange. It encourages submissions both from scholars working in anthropology and those in other disciplines whose work can make a substantial contribution to topics of concern to anthropologists. 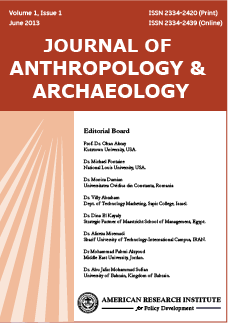 The journal publishes original papers that promote theoretical, methodological and empirical developments within the disciplines of anthropology and archeology. All research articles published in Journal of Anthropology and Archaeology have undergone rigorous peer review, based on initial editor screening and anonymized refereeing by at least two anonymous referees. Each paper published in Journal of Anthropology and Archaeology is assigned a DOI®number, which appears beneath the author's affiliation in the published paper. Click HERE to know what is DOI (Digital Object Identifier)? Click HERE to retrieve Digital Object Identifiers (DOIs) for journal articles, books, and chapters. Dr. Jing Lei, Dept. of Anthropology, State University of New York at Oswego (SUNY-Oswego), USA. Dr. Türkay Bulut, Haliç University, Turkey. Dr. Ayman Alshboul, Department of Anthropology, Yarmouk University, Jordan. Dr. S Manzoor Hussain Shah, Allama Iqbal Open University Islamabad, Pakistan. Hala Elhoweris PhD, United Arab Emirates University, UAE. Prof. P. Prayer Elmo Raj, Karunya University, India. Dr. Grace Etuk, University of Calabar, Nigeria. Dr. Ese Odokuma, Delta state University, Abraka Nigeria.